Any 60 Asteroids can be put in Wheel. 1000 other asteroid positions are in a list. Asteroids Wheels: Automatically select an asteroid wheel already set up for your order create your own. You can also put up to 60 asteroids on the regular chart wheel. AstroMaps: Maps of any geographic area of the world with lines drawn through them which indicate areas of astrological sensitivity. A horizon map is a slight variation of a local space map; the horizon map plots the actual house cusps whereas in a local space map house Asc lines are drawn due east-west and the MC lines are drawn due north-south. The planet lines in a horizon map and local space map are identical. 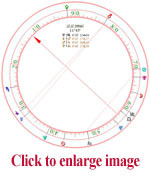 Zodiac Sign Maps: AstroMaps that show where the zodiac sign of the Ascendant and MC change. Atlas: Complete atlas, time zones, and daylight savings time information, updated with each new version of SIRIUS with recent changes in laws. Atlas, Hospitals in the USA included: Some cities are 10 miles or more in diameter. If a person is born on the east edge versus west edge of the city, there can be a difference in the house cusps of 10 or 15 minutes and in some cases even more. To obtain more accurate charts, you can now select the hospital where a person is born in many places in the USA (hospitals in other countries are not available).